Innotech is proud to announce the latest recipient of the BMS Controls Course Student Award. The award consists of a quality screwdriver set that was kindly supplied by Dean Grimmbacher of Phoenix Contact. The award is presented to the student that has shown the greatest aptitude and commitment during the industry controls course which is held at Innotech headquarters in Brisbane. It is open to all course attendees and the winner is selected by the trainers. The October 2015 award goes to Daniel Smith from CL Macs in Gympie. Daniel's commitment and dedication to learn new tasks showed throughout the two day course. This was particularly impressive given that he has had little previous exposure to HVAC and BMS systems. Daniel's work ethic and commitment reflected in completing all the required tasks in a timely manner. His keen attitude and willingness to experiment and find solutions to problems was also observed, in addition to his ability to work with others. Given his non-HVAC background, we thought that Daniel was a worthy recipient of this prize. 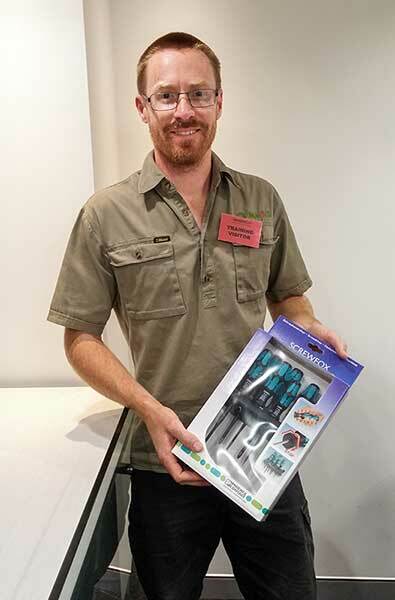 Well done Daniel and enjoy your new screwdriver set. Congratulations from Innotech and Phoenix Contact. Daniel Smith from CL Macs located in Gympie, QLD.